This is a decades long study of people and happiness. Here is an introduction to the book that you can find on the following site. At a time when many people around the world are living into their tenth decade, the longest longitudinal study of human development ever undertaken offers some welcome news for the new old age: our lives continue to evolve in our later years, and often become more fulfilling than before. 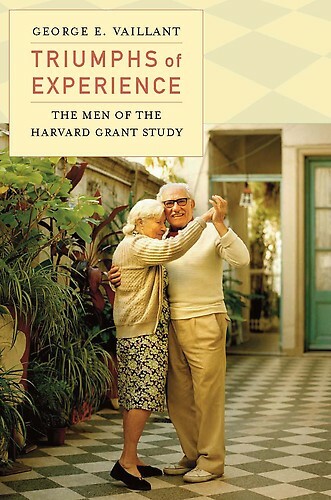 Begun in 1938, the Grant Study of Adult Development charted the physical and emotional health of over 200 men, starting with their undergraduate days. The now-classic Adaptation to Life reported on the men’s lives up to age 55 and helped us understand adult maturation. Now George Vaillant follows the men into their nineties, documenting for the first time what it is like to flourish far beyond conventional retirement. Reporting on all aspects of male life, including relationships, politics and religion, coping strategies, and alcohol use (its abuse being by far the greatest disruptor of health and happiness for the study’s subjects), Triumphs of Experience shares a number of surprising findings. For example, the people who do well in old age did not necessarily do so well in midlife, and vice versa. Marriages bring much more contentment after age 70, and physical aging after 80 is determined less by heredity than by habits formed prior to age 50. The credit for growing old with grace and vitality, it seems, goes more to ourselves than to our stellar genetic makeup. George has studied health and happiness in both women and men. So what advice can we give young people about shaping their futures? As you might expect, the way people cope with life’s setbacks makes a difference. “Mature or adaptive defenses from age 20 to 50 are an important predictor of successful psychosocial aging,” the study report notes. Prior to age 50 almost two-thirds of the happy-well men, but only one-tenth of sad-sick men, had used mature defenses. “Life ain’t easy,” Vaillant points out. “Terrible things happen to everyone. Immature defenses, on the other hand, produce sad results. Don’t blame others for your problems, or deny that you have problems. Having imaginary rather than real friends causes more problems than it solves. So does distracting yourself by sipping scotch and watching television. “Aging happy and well, instead of sad and sick, is at least under some personal control,” says Vaillant as he sums up the 64-year study, which was supported primarily by the National Institute on Aging. “We have considerable control over our weight, our exercise, our education, and our abuse of cigarettes and alcohol. “With hard work and/or therapy, our relationships with our spouses and our coping styles can be changed for the better. George has contributed considerably to the concept of positive aging. He spoke about this topic at the International Conference on Positive Aging in 2010. Here are the first two parts of his talk. These will, if you wish, lead you to the rest of his session.